As with OldScout Whiskey, we’re excited to bring rare spirits to market when they cross our paths and impress our palates. Revelation is a fine “ron anejo” from the Caribbean, having made the long journey from near the Blue Mountains of Jamaica to the Blue Ridge Mountains of Appalachia. It’s smooth, delicious and makes us want to travel someplace warm. Even if it’s just to the back porch. Caol Ila, (pronounced ‘cull-eela’) is the Gaelic name for the Sound of Islay, in reference to the distillery’s location overlooking the strait between Islay and Jura. Built in 1846, Caol Ila is the largest of the eight working distilleries on the island of Islay. NOSE: Fruity and tangy with notes of salty butter, toast, wet stones on a beach, linseed oil, a little peat smoke, kippers and sweetness. 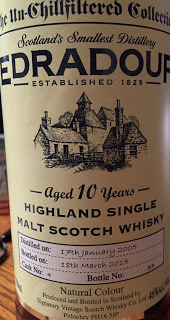 TASTE: Rich and tangy palate, with good spice notes, citrus peels, black pepper, malt and smoke. A little smoked oyster note. FINISH: Spicy, fruity and peaty. A little burning cardboard. ABV: 51.6%Named after the Isle of Islay’s Loch Laphroaig, this single malt whiskey distillery has been operating since its establishment in 1815. Home of the only whiskey to carry the Royal Warrant of the Prince of Wales, this esteemed distillery uses traditional methods to create it’s distinct malt. With a rare 5-star rating from renowned critic Aaron Knoll of TheGinIsIn.com, Halcyon has quickly ascended to the highest tier of fine gins. A classic London Dry aromatic profile with a citrus-forward brightness shape a gin that is both traditionally engaging and versatile for bold explorations. Aromatics steep for 24 hours in our hand-hammered copper kettles, followed by a masterful distillation to capture the essence of Halcyon. I found it hard find a cocktail that I did not like this gin in…Beautiful…Where other gins sometimes wilt, or highlight ‘off’ notes, Halcyon excels across the board. True Kinship is in our bourbon: the kinship we share with local farmers, our distillers, barrel makers and most importantly with you. Artisanal vermouth produced by Bodegas Cruz Conde from an Oloroso base of PEDRO XIMÉNEZ grown within the Montilla-Moriles DO.Oxidative aging in American oak barrels by Criadera and Solera for a minimum of 5 years. Aromatized with a maceration of traditional Mediterranean botanicals including gentian, bitter camomile, thyme, juniper, wormwood, among others. Intense in aromas and well balanced on the palate. 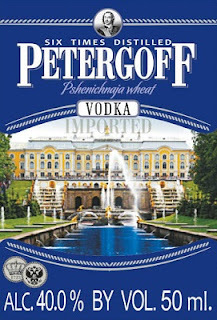 Subtle and pleasant, traditional apéritif. 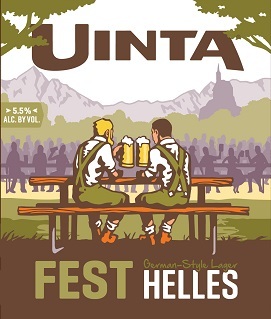 Fest is a delicate balance of malt and hops. With its bready malt character and grassy aromatics, this German-style lager is the perfect go-to for late Summer drinking, lederhosen optional. Distinctively high-toned, concentrated and complex aromas of earthy black fruits, violets, slate, dark chocolate and spice characterize the nose of our 2011 Vine Hill Cabernet Sauvignon. Deep, dense and powerful on the firmly structured palate, the wine’s intense, dramatically concentrated blackcurrant, blackberry, dark plum and mineral flavors are bolstered by firm, yet refined tannins and balanced acidity, leading to a long, savory finish accented by earth, mineral, chocolate and toasted oak tones. We are $50 a bottle less than the next person online!! only 4 bottles leftVibrant, focused and elegant, but needs time to bring everything together. Offers deep flavors of currant, blackberry, potpourri and spice that weave together seamlessly against a gentle grip of tannins, expanding beautifully on the long and expressive finish. Best from 2017 through 2030. 990 cases imported. An utterly majestic Shiraz, sleek and seamless, brimming with ripeness on a framework that allows for grace and expressiveness in equal measure. The intensity of fresh blueberry and plum fruit holds attention until the nuances kick in, offering glints of exotic spice, coffee, cocoa, bay leaf and mint. Shows tremendous presence without a lot of weight, the tannins present but not even close to getting in the way. A great wine now, with plenty of room to grow. Drink now through 2040. From Australia.—H.S. We have 8 bottles in stock. The 2010 Grange arrives with much expectation and does not disappoint. This is a powerhouse, structurally superior to both the 2009 and 2008 vintages and breathtakingly dense, long and precise. The nose has cola, blackberry, vanillin, hard brown spices of all kinds, coal smoke, meaty charcuterie elements and a strong tarry, savory note that speaks of the 85% Barossa Valley componentry. The palate has super deep tannins that fan out through flavorsome black fruits. These are purposeful tannins; they bristle on the palate, tantalizing and assertive yet playful, strong not aggressive. The power here is the thing; this has mouth-coating density and terrific drive, so tightly coiled, it gives enough away to suggest a very, very long cellaring wine is here. This is a classic Grange that will please the serious collectors. A wine of genuine pedigree. Better in 2026. 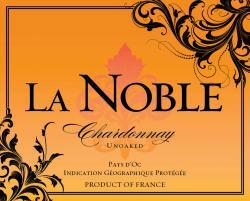 2014 La Noble Chardonnay...$12.99There’s a whopping 11,000 cases of La Noble’s 2014 Chardonnay, and like the 2013, it’s another terrific value. Medium-bodied, pure and elegant, with notable freshness in its melon, apple and green citrus bouquet, it has crisp, yet integrated acidity, a dry, clean finish and tons of charm. Fermented in stainless steel tanks, at cool, controlled temperatures. Aged "sur lie" until bottling. This is a store favorite unoaked 100% Chardonnay. Fresh peach and pear aromas on the nose, with a subtle hint of acacia. Lush yet lively - a beautifully balanced Chardonnay. 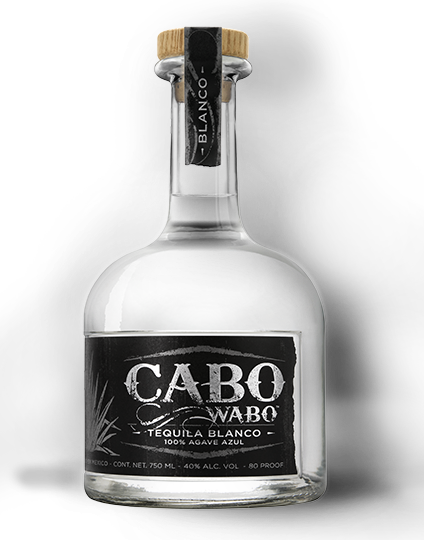 Cabo Blanco is pure, no-holds-barred, Thick Cut tequila. We turn 100% Weber Blue Agave into tequila the way it was meant to be – with full-on agave you can taste. It's never influenced by barrel wood – only by hard work, passion and dedication without apology. Cabo Reposado takes Thick Cut tequila to the next level, aging it for 4-6 months in American oak barrels. Built for those who don’t shy away from bold agave flavor, this is the tequila that stands up to any drink while earning the right to be savored on the rocks. Back in stock. This one comes and goes. But we now have a good enough supply in stock to actually tell you it is back on the shelf now. Starts out with great spicy, minty notes & when water is added the nose makes you want to set up a tent in the woods! Classic caramel & vanilla notes shine on the palate with light cedar & more mint notes prevailing at the end. Palate: great caramel & vanilla notes… Very cliché to describe a Bourbon like this, but these notes really shine here. Apricot, cigar boxes and cellars. Aged in wooden barrels, bottled by hand at 57.15% alc./vol. (114.3 proof) Noah’s Mill Genuine Bourbon Whiskey is handmade in the hills of Kentucky. This is a Bourbon of extraordinary character and smoothness not found among younger whiskies. Its superior taste and flavor characteristics are made possible only from using the very finest quality ingredients at the outset along with the long years and patience necessary for nature to mellow everything to perfection. We bottle this Bourbon at a strength that best compliments its age, and we’re sure you’ll enjoy it like no other Bourbon. We have been informed of our allocation. It will be arriving this fall. Do not miss what is considered to be the best Opus One ever made. The greatest Opus ever. Terrific aromas of crushed black currants, blueberries and flowers with hints of sweet tobacco. Roses continue to exude opulence and class. Full body, superb balance of ultra-fine tannins and vibrant acidity. Complex aftertaste of black fruits and citrus fruit. Extremely persistent. So approachable now and enjoyable. But will be even better in 2019 and beyond. 79% cabernet sauvignon, 7% cabernet franc, 6% merlot, 6% petit verdot, 2% malbec. This will always be beautiful to drink. Butterscotch Gold brings out tastes of brown sugar, caramel, and vanilla that informs memories of kettle corn at the county fair. Slight hazelnut notes and a lingering cream flavor contribute to a long finish that cannot last long enough. Peanut Butter and Jelly moonshine? Yes! Taste the fruity burst of concord grape jelly balanced out by delicious peanut butter (creamy or crunchy depending on your persuasion). It’s a classic comfort combination shouting “howdy" to your inner child. It’s nuts! Fluid Dynamics The 1850 Cocktail - pre-made - Sazerac! Here’s me and Devin Cain of the American Craft Whiskey Distillery tasting various experimental blends for our recently-released Fluid Dynamics aged cocktails. The 10-liter barrel on the counter behind my glass in the foto holds the first experimental batch of a Sazerac cocktail (we had to call it the 1850 – the year the Sazerac bar opened in New Orleans – because "Sazerac" is a trademark). You've probably noticed that a lot of good bartenders are blending cocktails in tiny barrels and aging them for a couple of weeks. It’s what gave us the idea for Fluid Dynamics. We are able to assemble our cocktails in 55 gallon oak barrels. We age them for about six weeks. It helps a lot that the blending is done by the same people that distilled the spirits we're using, because they have a good idea of what’s going to happen in the barrel. When we experimented with the 1850, we learned that it is very different to age a product with absinthe in it than it is to simply mix a drink containing absinthe: the interaction of the components over time is a powerful factor. We decided not to include bitters, because no matter how little we used, after six weeks, the bitters taste was too strong. Because we age Germain-Robin varietal brandies for quite a while before starting to blend them, we were able to experiment with brandies distilled from different grapes. Brandies from aromatic grapes (like Riesling and Muscat) performed the best. A good drink that is mixed and handed to you is composed of complex and distinctive ingredients. 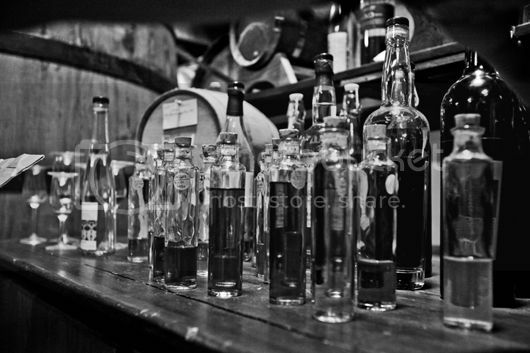 If you take the time to age those ingredients together in barrel, they merge into a richer and more harmonious whole. To our palate, the aged version is about four times as good as a drink that has been freshly assembled. Similar things happen to our whiskies and brandies in the cellar (when we prepare a blend, it takes at least two years, sometimes five, for the components to fully “marry”). 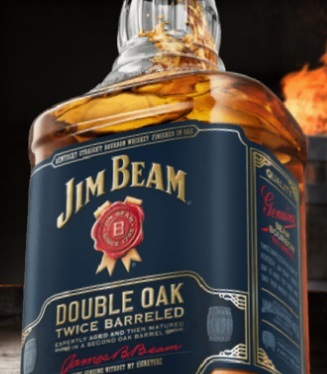 Like all of our bourbons, the new Jim Beam® Double Oak is crafted in charred oak. 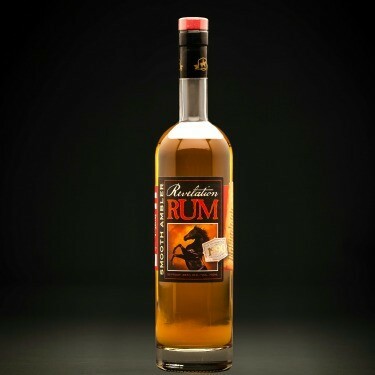 Its rich flavor comes from being aged a second time in another separate barrel. Jim Beam® Double Oak is first aged in charred American white oak barrels, then we pour it into another freshly charred barrel to mature for a second time. 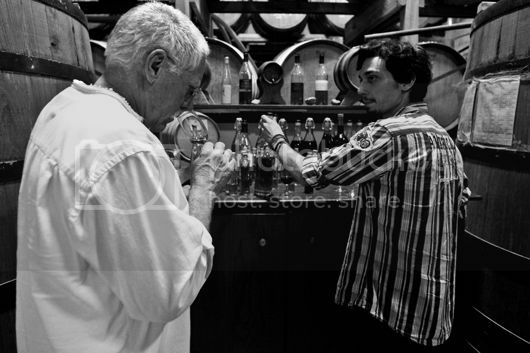 The added interaction with the oak wood results in a liquid intense in flavour, smooth in taste. 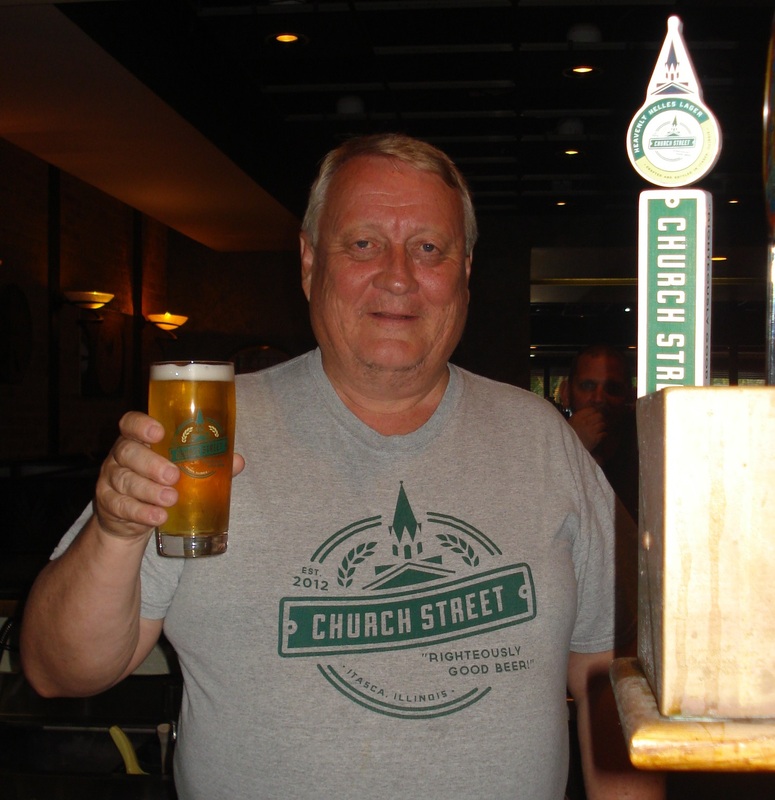 Located in Itasca, Illinois (just 10 miles west of Chicago), Church Street Brewing Company is a new craft brewery that has quickly grown into a reputable name in the Chicago area. Owners Joe and Lisa Gregor use traditional German brewing methods to craft their wide range of lagers and ales that represent both old and new beer styles of European influence. The Gregors are churning out approachable, award-winning beers and continuing to grow their brewery's ever-expanding footprint in the region. We are a family business built on a dream to make quality ales and lagers that stand out from the crowd. One of Germany’s quintessential beverages, now in Chicagoland. Utilizing old world decoction mashing techniques for a truly unique sweet malt character, this gentle drink also features a straw colored-clarity that’s clearly heavenly. Brewed to eliminate Gluten! 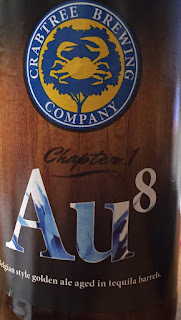 Smooth and drinkable, yet malty and complex with a noble hop kick. Four German malts with three German hop varieties combine to create our quintessential pilsner. Notes of biscuit and grassy/floral hops make this a great beer to kick back with anytime. Enjoy! In centuries past, to ensure a plentiful crop, the Celts would donate a variety of malts for a community ale to please the Shony, a local water spirit. Sadly, the custom dictated that they throw it all in the ocean. Our traditional 80 Shilling Scottish-style ale is a robust brew with notes of sweet caramel and mellow roast – best enjoyed on land, not in the ocean. Church Street is proud to present our take on the American IPA with this dry-hopped West Coast IPA that’s brimming with Cascade aroma, giving this tangerine-beauty a fruity and refreshing nose – don’t be surprised if you find yourself sniffing more than sipping! A bold bitterness is rounded out by notes of citrus and grapefruit and a slightly dry hoppy finish. Cheers! A pale, Southeastern Polish Style Pilsner, decoction mashed using floor-malted barley for a full malty flavor. Featuring Lublin Hops for a mild, lemony and refreshing characteristic. Devil’s Advocate begs the question: What happens when you take a ton (literally) of Pilsen malt, put it through a decoction mash, boil it up, add another 500 lbs of Belgian candy and kane sugar, and then add some of Duvel’s world famous yeast? The answer: A spicy, sweet, and dangerously drinkable Belgian golden strong ale. A golden, medium-bodied bock. This Weyermann-malted, double-decoction-mashed traditional German maibock features subtle hints of toast and caramel from carahell and dark Munich malts and a strawberry-like sweetness from the extended boiling of the malt. Featuring three different German hops varieties to ensure a complex, full character. 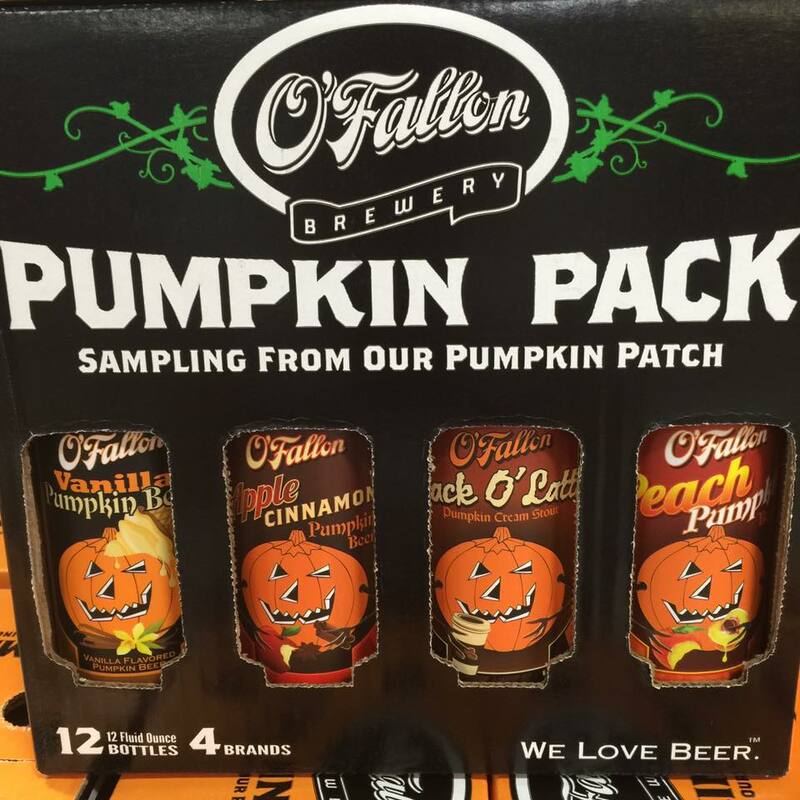 Church Street’s first fall seasonal! A truly traditional German Marzen/Oktoberfest featuring a pure amber clarity. A subtle toasty aroma with a hint of caramel, and a rich, deep malt character fully fleshed out with a double-decoction mash and Weyermann’s world class German malt. Prost! 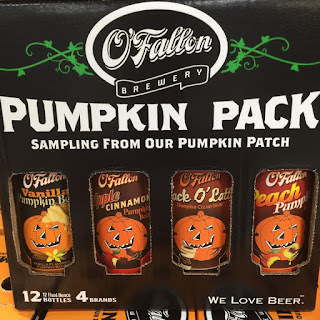 Jolly Pumpkin Cucurbitophobia -"fear of pumpkins"